A sinkhole — or, rather, sinkholes — at Marine Corps Recruit Depot Parris Island has forced officials to close one of the base’s major causeways. The causeway, which dates to the 1960s, is revealing of the depot’s history and construction and has, in past years, been scrutinized by the Environmental Protection Agency. Warning signs first surfaced Dec. 19, according to an email sent Wednesday evening by Parris Island spokesperson 1st Lt. Bryan McDonnell. The depot’s Facilities Maintenance Division “observed a sinkhole beginning to form on the shoulder of 3rd Battalion Causeway,” above culverts on the southeast end of the road, McDonnell wrote. The Corps continued to assess the area and, on Jan. 18, decided to close the road. The causeway extends southeast from the traffic circle near the base’s security gate and bisects a marshy area to the south and what’s known as the 3rd Battalion Pond to the north before intersecting with Wake Boulevard. 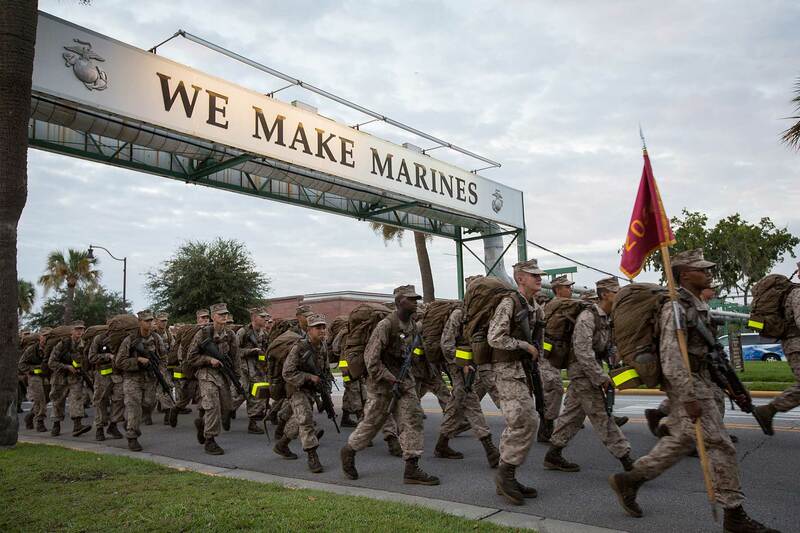 The road is a major artery onto and off of the depot — one Marines and visitors use daily and, especially, for heavy-traffic events such as boot-camp graduations. Crews continued to examine the causeway and found “several smaller sinkholes,” he wrote. According to a 2011 Naval Facilities Engineering Command report, the causeway was “gradually constructed across a tidal marsh using layers of solid waste, fill dirt, and other debris” from the 1960s to 1972. Parris Island is a superfund site, one of thousands of contaminated areas across the county the EPA has targeted for clean-up, according to the agency’s website. More specifically, the area that contains the causeway and the pond was once home to a landfill, and is designated as Site 3. “Site 3 functioned as the major disposal area for trash and other materials discarded in dumpsters around MCRD Parris Island during most of the period between 1960 and 1972,” the report said. Environmental assessment of Site 3 dates back to the mid-1980s, according to the report. The pond, which used to be a popular fishing spot, was closed to fishing after assessments found elevated levels of contaminants — mercury being one — in the site’s aquatic life. The depot began prohibiting fishing there in December 2010, according to a Parris Island fish-pond study report. A 2016 report by Resolution Consultants, a firm working with the EPA and the depot, noted erosion and sinkhole concerns along the causeway and its culverts would require continual assessment and repair. Malecon Drive lies to the north of 3rd Battalion Causeway and also connects the heart of the base to its security gate. This article was written by Wade Livingston from The Island Packet Online and was legally licensed via the Tribune Content Agency through the NewsCred publisher network. Please direct all licensing questions to legal@newscred.com.